THE MAN WHO "THOUGHT" HIS WAY INTO PARTNERSHIP WITH THOMAS A. EDISON TRULY, "thoughts are things," and powerful things at that, when they are mixed with deﬁniteness of purpose, persistence, and a BURNING DESIRE for their translation into riches, or other material objects. 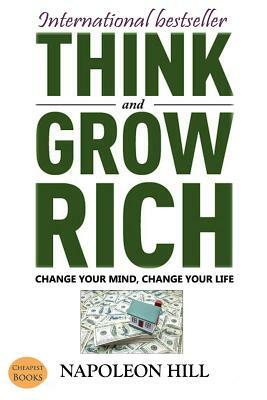 A little more than thirty years ago, Edwin C. Barnes discovered how true it is that men really do THINK AND GROW RICH. His discovery did not come about at one sitting. It came little by little, beginning with a BURNING DESIRE to become a business associate of the great Edison. Somewhere, as you read, the secret to which I refer will jump from the page and stand boldly before you, IF YOU ARE READY FOR IT When it appears, you will recognize it. Whether you receive the sign in the ﬁrst or the last chapter, stop for a moment when it presents itself, and turn down a glass, for that occasion will mark the most important turning-point of your life. Remember, too, as you go through the book, that it deals with facts and not with ﬁction, its purpose being to convey a great universal truth through which all who are READY may learn, not only WHAT TO DO, BUT ALSO HOW TO DO IT and receive, as well, THE NEEDED STIMULUS TO MAKE A START. IN EVERY chapter of this book, mention has been made of the money-making secret which has made fortunes for more than ﬁve hundred exceedingly wealthy men whom I have carefully analyzed over a long period of years. The secret was brought to my attention by Andrew Carnegie, more than a quarter of a century ago. The canny, lovable old Scotsman carelessly tossed it into my mind, when I was but a boy. Then he sat back in his chair, with a merry twinkle in his eyes, and watched carefully to see if I had brains enough to understand the full signiﬁcance of what he had said to me. When he saw that I had grasped the idea, he asked if I would be willing to spend twenty years or more, preparing myself to take it to the world, to men and women who, without the secret, might go through life as failures. I said I would, and with Mr. Carnegie's cooperation, I have kept my promise. This book contains the secret, after having been put to a practical test by thou-sands of people, in almost every walk of life. It was Mr. Carnegie's idea that the magic formula, which gave him a stupendous fortune, ought to be placed within reach of people who do not have time to investigate how men make money, and it was his hope that I might test and demonstrate the soundness of the formula through the experience of men and women in every calling. Napoleon Hill was an American author in the area of the new thought movement who was one of the earliest producers of the modern genre of personal-success literature. He is widely considered to be one of the great writers on success. His most famous work, Think and Grow Rich (1937), is one of the best-selling books of all time (at the time of Hill's death in 1970, Think and Grow Rich had sold 20 million copies). Hill's works examined the power of personal beliefs, and the role they play in personal success. He became an advisor to President Franklin D. Roosevelt from 1933 to 1936. "What the mind of man can conceive and believe, it can achieve" is one of Hill's hallmark expressions. How achievement actually occurs, and a formula for it that puts success in reach of the average person, were the focal points of Hill's books.